The RS485 interface has gained quite a common application in Fieldbus networks. This is a high-speed and interference-resistant serial interface which makes it possible to create networks connecting many devices into a common bus. Over the RS485 interface, data are transferred in the form of a ‘symmetrical’ (differential) signal over two lines (D+ and D-). The maximal distance between the extreme devices may reach 1200 m (with repeaters even more). If a communication line is 100 m and longer it is strongly recommended to use termination resistors (from 100 to 250 ohm) on both ends of the line to eliminate reflections. The number of devices in any RS485 network may not exceed 32 nodes (without repeaters). This interface is based on EIA RS232C and is intended for a serial connection between two devices. The RS232 is widely used to connect external equipment to a PC. The RS232 interface implements the asynchronous serial communication form of signal transmission over two lines: TxD (transmit data) and RxD (receive data) while the signal amplitude is measured relating line GND (‘grounding’). Since data transmission over the RS232 interface is normally asynchronous, it causes low noise immunity. As a result, the line length is usually limited to a few meters. Two communications lines provide full-duplex data transmission, meaning the data can be transferred in two directions simultaneously. The RS232C specification does not contain any description of a connector to be used. However, the most common types found are the 9-pin and 25-pin connectors (DB9 and DB25). Ethernet is a data transfer technology for connecting devices to computer networks, mostly to local area networks (LAN). The data access in such networks is controlled by the CSMA/CD method. This acronym stands for Carrier-Sense Multiple Access with Collision Detection. Under this method, devices exchange signals only after detecting an idle state on a wire in order to cut down on collisions. All forms of Ethernet support up to 1024 nodes in a network. This interface has come into widespread use due to its high data bandwidth and interference resistance. Standard USB was developed as an alternative to previous network standards RS232 and IEEE 1284. At present, many devices are equipped with interface USB 2.0 which allows them to transmit data at the rate up to 480 Mbit/s. The USB interface same as the RS485 interface can transmit data over two wires (D+ and D-) and logic levels are identical to those of the RS485 standard. This interface additionally has two more wires (Vcc and GND) for powering the connected device (provided that its current consumption is max. 500 mA). Once an appropriate driver is installed, the OS automatically recognizes the device connected to the USB port as a COM port and operates in the standard asynchronous transfer mode applied to operation with a hardware COM port. 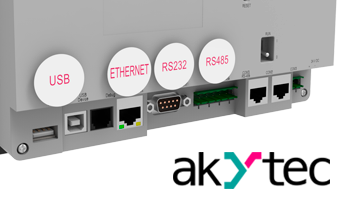 The RS232 and RS485 interfaces support asynchronous data transmission. The data are transmitted bytewise. To signify the beginning and the end of the transmitted byte (character), each byte is separately framed with start and stop bits. The bits between the start and the stop bit are called data bits. They usually make 5, 6, 7 or 8 bits of information. The number of standard data rates have been adopted for asynchronous transmission: 50, 75, 110, 150, 300, 600, 1200, 2400, 4800, 9600, 19200, 38400, 57600, 115200 bit/s. Concerning the protocols, the most of akYtec devices communicate via Modbus ASCII/RTU. More details about it will go in one of our next posts.